Religious birthday party themes are one of the most popular and versatile themes requests received by Creative Cakes. 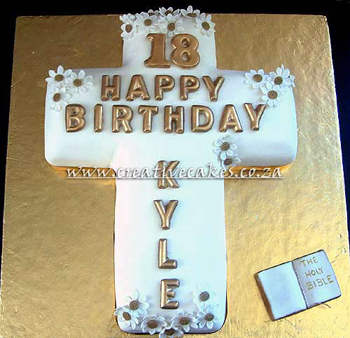 This cross cake was made for an 18th birthday party however, the options are endless. Some ideas include, a stunning baptism cake, is great when decorated for Easter, confirmations, religious birthdays, special birthdays and anniversaries alike not to mention a simple, yet beautiful wedding cake. Another good idea for a cross or other religious cake could be a rather impressive fun raising raffle prize for a church fete. This has been done before and really was a raging success! Just think of it: a hand sculptured 3D cross cake decorated with a spray of delicate fresh flowers defiantly creates a very attractive and extremely tasteful show. Another tasteful extra for any religious cake could be a message or a verse from the Bible written on the cake or even next to it on an editble Bible. The options are endless, all ideas are doable, so let Creative Cakes help you complete any birthday party themes you may have!